Sharing some totally random, but very helpful tips for you guys if you're ever live here or visit! Trust me, I've had a LOT of experience with this stuff! Check out the video below! Be sure to watch towards the end of the video to enter a really fun giveaway! I'll be picking winners next Thursday! I subscribed! :) Hope I win! Great post! As a born and raised New Yorker, I officially approve and love this video ;) So good! Subscribed love the video I'm a New Yorker. Subscribed! 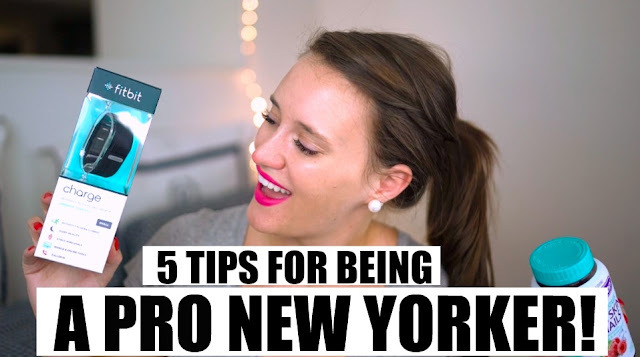 Love these tips, sending them to my friend who is going to NYC for an internship! I'm subscribed. Thanks for the awesome giveaway! You were actually the first blog I've ever followed back in the day :) Love how real you are! I'm subscribed! Love your blog and videos! Thanks for sharing and doing a giveaway instead of keeping them all for yourself! I take a gummy multi-vitamin, but I like the idea of the sleep one. Hi! I love the cab tip number 2. I always forget things in Barcelona, so, good tip! Thanks! Subscribed! As someone who is all about her vitamins, this would be a great giveaway to win! Thanks for hosting girl! PS - I had no idea about the pausing fare in a cab - sooo helpful! I'm subscribed! Love your videos!! You are so hilarious and relatable. Such a classy UK lady, of course! I live right outside NYC and 100% agree with all of your tips! Checking for your belongings is something that I always forget to do, and have lost a few too many things. The worst feeling in the world is leaving your iPhone in the back of a cab, watching it drive all around Manhattan on "find my iPhone" and the driver refusing to give it back. Ugh!! I subscribed!! I follow your blog religiously and I just love, love, love your fashion style. Thanks for the fun giveaway! I have been wanting to get into vitamins for so long now. When I was younger I would eat vitamin gummy like candy and then instantly regret it because I thought I could overdose on vitamins. At least now I'm older and wiser. I can't believe you have been in New York for 3 years I remember when you were a Junior at UK. I am subscribed of course probably on like 3 different platforms. I subscribed. I liked tip about putting your metro card in the phone case. Subscribed! Krista, I absolutely love your blog! As the least fashionable person you could ever meet, you are my spirit animal. Awesome content and super adorable person! I totally mean it regardless of the contest! Subscribed! Love that tip about keeping vitamins at your work desk! In my work bag I keep a spare contact lens case filled with my daily vitamins for days I forget to take them at home... which is far too often and then I never remember to fill up the case again, haha. Your idea is way better! Subscribed! I work in NYC so these tips are all SO true! I love your videos! Already a subscriber (and a huge vitamin fan). As a frequent traveler, vitamins are clutch in keeping me healthy. I would LOVE to win! Subscribed! Love this post as I do all of them! I am a big nutrition fanatic and would LOVE to try out these vitamins! !